War can get ugly. But sometimes it can be beautiful. 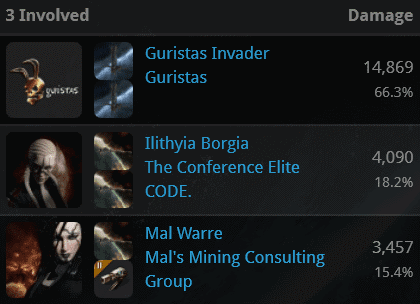 We have always been the most transparent organization in EVE. For additional accountability, Agent Kalorned of the The New Order Gamis Affiliates has been put under the microscope. Are his actions in Gamis justified? Watch the video and see for yourself. Afterward, why not check out Gevlon Goblin's post on CODE. 's 2014 kills? There are plenty of numbers there--numbers which reinforce the theory (an established scientific fact now, really) that the CODE always wins. Can't wait for the 2015 stats! New Order shares are the ultimate in good taste. If you want to make a statement, get some shares in your name. When people see your picture on the Shareholders list, they'll know how much you care about the EVE community. You know what else? Good taste is contagious. Ben Li was the latest to add his name to the Shareholders list, which is sort of a roll of honour for EVE. 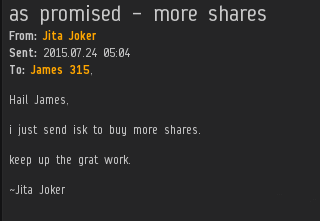 He started out strong, purchasing 111 shares, which was just enough to put us over the 721 billion isk mark. Ben Li now has another accolade to proudly display--a Supreme Protector's Tip of the Hat™. Buy shares and ensure that you get your fair share of highsec's future. Highsec, we're all in this together. The New Order has grown by leaps and bounds. Now even the farthest reaches of New Order space are patrolled by our Agents. An elite detachment consisting of Agents Get Well Soon, Mark Eting, and Lisa Tears set out on an expedition to the Genesis region. They were prepared for whatever they might find in the boondocks of highsec. Our heroes discovered an Orca piloted by dutchkiwi. A quick background check revealed him to be a rebel. 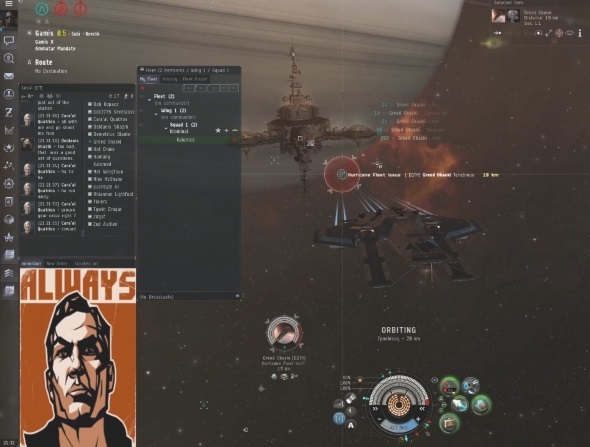 The carebear claimed to be affiliated with a nullsec alliance. It was odd, really: Though he was friendly to CVA, he wasn't friendly to the New Order, which ruled the space he actually lived in. Alongside dutchkiwi's Orca was his Hulk alt, Pureminer Pava. That's when things got interesting. As soon as Pureminer detected a New Order presence in local, he swapped out his Hulk in favor of a combat ship, a Stratios. He intended to ambush our Agents with a counter-gank! Pureminer fell victim to something he couldn't possibly have expected: A counter-counter-gank! Our Agents landed on grid and tore apart his disturbingly fail-fit Stratios. Despite Pureminer's rebellious attitude, our Agents were optimistic. If a carebear is alert enough to watch for gankers and willing to go to the effort of setting a trap, he might have a little Gallant left in him. 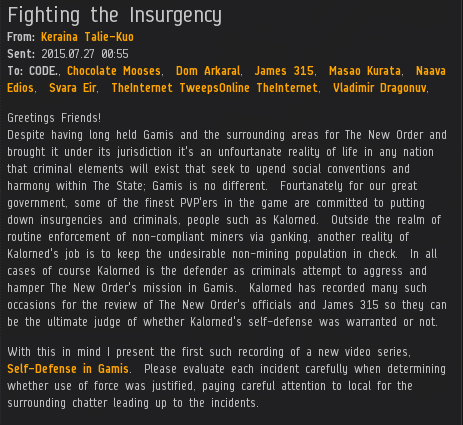 Many "active" rebels have joined the New Order because they realize that they enjoy playing the game more than isk-grinding. On the other hand, some rebels completely buy into the notion that our Agents can only shoot ships that can't shoot back. They think the New Order is a bunch of pushovers--rather than elite warriors, as is actually the case. Rebels with this attitude don't handle it well when they're beaten by the New Order. It wasn't long before our heroes wondered if Pureminer was one of those rebels. Early indications were negative. Even when told to calm down, the miner remained in an angry state. Pureminer Pava was indeed one of the carebears who was willing to try PvP but didn't like it very much. The experience had only solidified his twisted love for an all-PvE playstyle. Deprived of his comfort zone, Pureminer began spewing Miner Bingo quotes and other standard-issue spin in local chat. The carebear's Stratios was "free", presumably just like everything else he'd earned from grinding. Insecure carebears like to switch over to their alts mid-conversation and shed tears from multiple characters. dutchkiwi, his Orca pilot, took point. Then the carebear did something very revealing: He played the "you only shoot ships that don't shoot back" card even though our Agents had ganked his combat ship, which he was actively attempting to use in an ambush against them. Agents, remember this lesson well. There are no circumstances under which a carebear won't play the "you only shoot non-combat ships" card. It is meaningless. It's merely something rebels say to make themselves feel better about the New Order's obvious superiority. The miner quickly abandoned any attempt to explain why his combat ship was a non-combat ship. He began desperately scraping at the remains of the bottom of the barrel. "I have kill rights, and I will use them!" Our Agents couldn't escape the feeling that maybe Pureminer Pava wasn't Gallant material after all. The carebear might not be cut out for the New Order, but could he at least be persuaded to calm down and buy a mining permit? Put yourself in the illegal miner's shoes for a moment. After no more than a moment in his shoes, you get ganked. Such is life in modern highsec. When you lose your fail-fit Retriever, what's the mature, adult response? 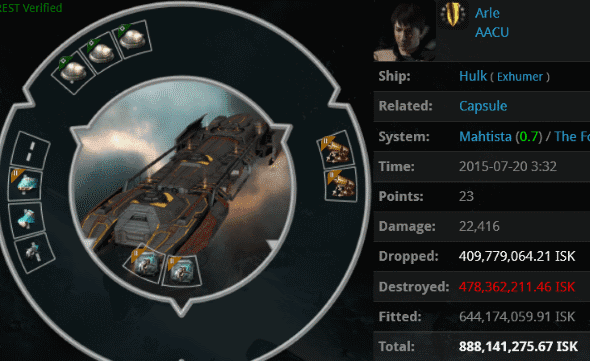 Judging by the carebears we've seen lately, the most natural reaction to losing a ship is to compare your fellow EVE player to the Interbus Ship Identification System. The system has developed a bad reputation, but maybe an upcoming revamp, FozzieISIS, will fare better. I'm only kidding, of course. Comparing us to a ship identification system would be silly. They compare us to a terrorist organization. 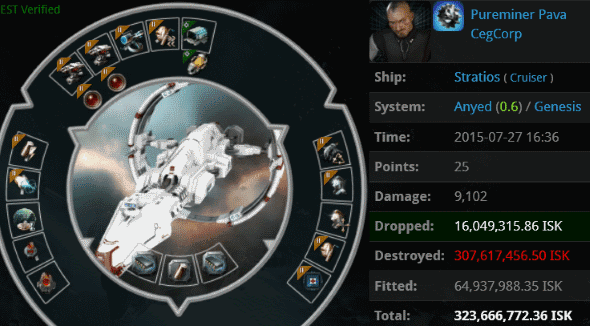 Fortunately, most EVE players recognize the carebear nonsense for what it is. Agent Mal Warre ganked Panda of Doom's Retriever. Then our Agent explained how absurd the miner was being. Two favors in one day! However, Panda stood by his ISIS analogy. According to the rebels, law enforcement in highsec is terrorism. If real-life terrorists were like the New Order, would everyone else behave like EVE's carebears? I shudder to think of all the babies left unattended, all of the crying and screaming--and the babies might cry, too. Even worse, the terrorists would always win. Panda had shocking ideas about highsec's purpose. Apparently he believed that EVE players are "developed" through years of AFK mining, autopiloting in fail-fit ships, ore buyback programs, and CEOs who tell everyone to stay docked up during a wardec. Developed, but into what? Bot-aspirants. Agent Mal told Panda that this was unacceptable. For his efforts, our Agent's integrity was questioned. Panda just didn't get it: In Mal Warre's spare time, she enforces the Code. That should've been obvious. Despite exchanging several EVEmails with an Agent of the New Order, Panda was not able to open his mind. He remained decidedly anti-permit. This puts the miner in terrible danger. As Panda himself knows, winter is coming, and he is not prepared for it. 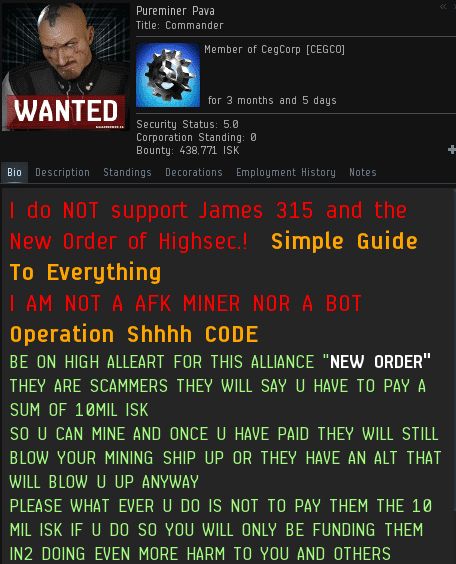 Madness and bot-aspirancy will keep a miner angry, but only a New Order permit will keep him warm. Previously, on MinerBumping... A valiant New Order/Imperium task force succeeded in destroying Aaron Alckschild's freighter, which was filled with BPOs. 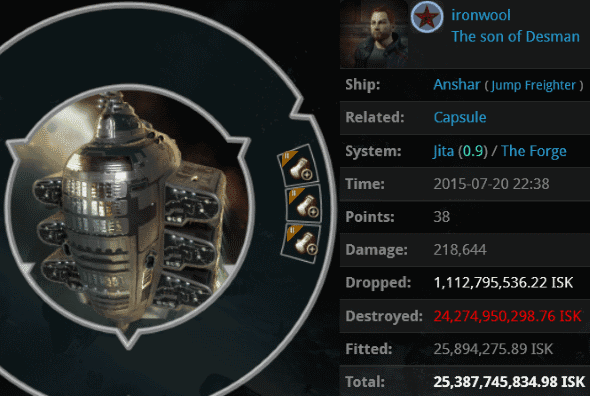 The total loss was over 10 billion isk--a frightful price to pay for the crime of bot-aspirancy. The bumper, Enia McCool, had offered to let Aaron go free for a small ransom. But Aaron had been supremely confident that he couldn't be ganked in a 1.0 security system, so he taunted the gankers. After losing all his stuff, Aaron changed his tune completely. He pleaded for the safe return of the blueprints. The carebear claimed to have only 1 billion isk left in his wallet. Almost everything he owned was in that freighter. Aaron was in a poor bargaining position. It was trivially easy for Enia to sell the blueprints on the open market for full price. The gank did occur in highsec, after all. Only a few moments earlier, Aaron had 1 billion in his wallet. Now he offered 3 billion for nearly 10 billion worth of BPOs. Typical carebear. Enia was now preoccupied with the task of tending to the newly acquired treasure trove. She invited Multiple Inbound Supercaps to the convo. Multiple was authorized to negotiate with the distraught carebear. However, Aaron was so busy wailing that he didn't even notice Multiple's appearance. Multiple Inbound Supercaps > is your caps lock broken? The first step, clearly, was for the carebear to calm down. Actually, Aaron didn't calm down very much. But he at least seemed more in control of himself once he did all his bawling in lower-case. Aaron Alckschild > what about the other bpos? Aaron Alckschild > other people took them? Aaron Alckschild > which ones are they? 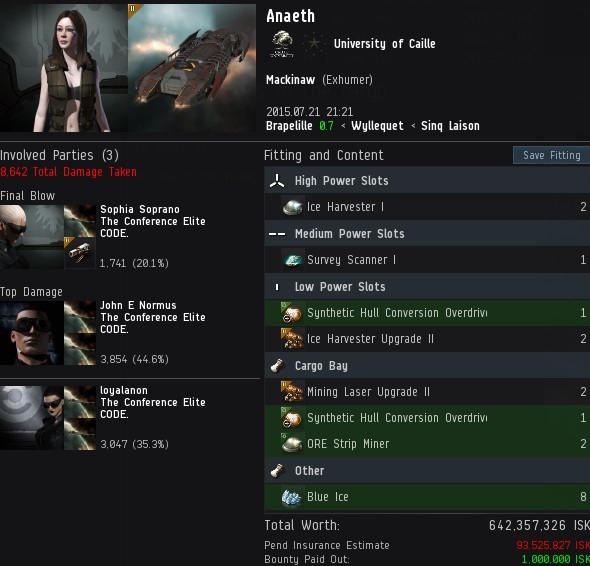 For the first time, Aaron learned that the gankers didn't have all 10 billion isk in their possession. Aaron Alckschild > wait a minute, so you only have the green ones? Aaron Alckschild > where the heck are the other ones then? Aaron Alckschild > destroyed how? It took a while for Aaron to come to grips with the fact that he'd lost much of his BPO library. He couldn't get those blueprints back, even if the gankers wanted him to. An EVE player since 2010, ladies and gentlemen. 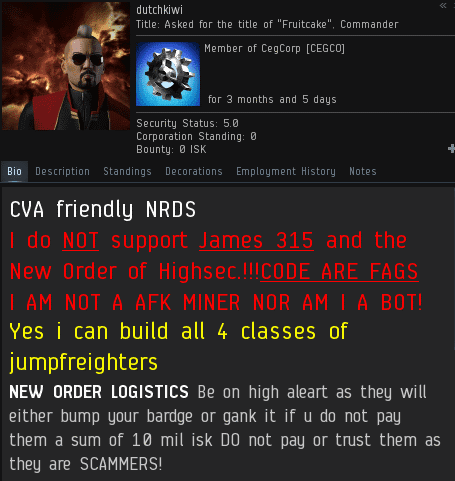 One of the reasons most of us don't have a great fondness for highsec PvE'ers is that they lie so much. 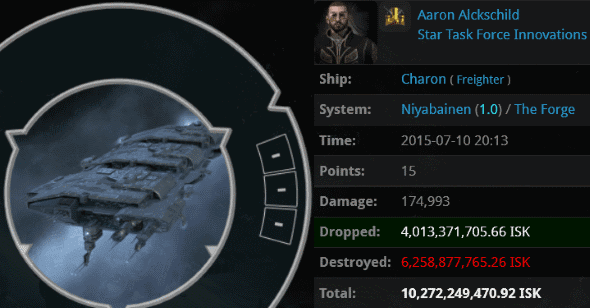 To summarize, Aaron claimed to have only 1 billion isk left to his name. Then he offered 3 billion for the BPOs, and now he had only 2 billion--all within the space of an hour. The carebear's wealth was rapidly fluctuating. Seconds later, Aaron was back up to 2.5 billion isk. And carebears accuse our Agents of being untrustworthy! For the sake of comparison, a New Order mining permit cost 10 million isk three years ago, and it costs the exact same amount today. You can safely rely on the New Order. For some reason, Aaron felt absolutely entitled to a hefty discount. But when was the last time a freighter pilot gave gankers a break? Deprived of the one thing he cared about, the carebear became unmoored from reality. He was flopping around like a fish out of water. Did Aaron have any hope of attaining redemption--or at least some of his precious BPOs? It was another bad week for bot-aspirant freighters. To be fair, we can't be sure his baby was actually crying. Maybe Krillnodd was on a laptop in some location with an echo. Meanwhile, the Anti-Ganking channel offered Krillnodd little hope. Except for an alt of the bumper, who encouraged him to buy a permit. The situation became desperate. Krillnodd didn't want to leave before seeing his freighter die, but he also had to deal with the baby in his house. (The other baby, I mean. The one that wasn't playing EVE.) Finally, he asked our Agents do put him out of his misery. They did it. Now let's see some killmails! Mysake and a few of his friends in Uedama didn't get the memo that CODEdot has a wardeccing corp comprised of members who have positive security status. When they saw one of our Agents sitting on a station undock in her Proteus, they couldn't resist attempting to kill her. Oops! That's not how highsec works. Agents Kaely Tanniss, Caldari Sentry Gun III, and CONCORD Police Captain joined forces to take them down. Kaely didn't even need to pay a wardec fee on that one. What's worse than equipping ORE Strip Miners to your ship? Putting them in your cargo bay while you mine with tech I ice harvesters. Anaeth was too lazy and too bot-aspirant to remember which station held her gear, so she kept it with her. She neglected to bring any kind of tanking modules, or a mining permit for that matter. 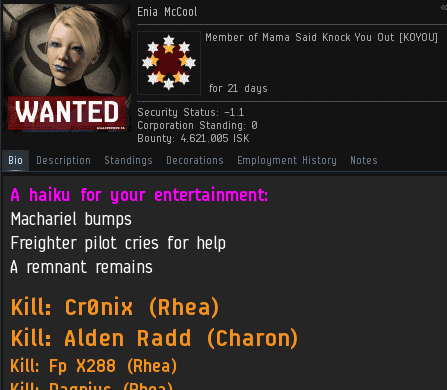 She was eliminated by Agents John E Normus, loyalanon, and Sophia Soprano, who also grabbed her 379 million isk pod, for an even billion isk loss. Agent Guristas Invader was steadily plinking away at the Hulk long before they arrived. But the pod was saved for the human gankers. It was a juicy one, worth 3.2 billion isk. Thus, Arle lost over 4 billion isk, all so he could steal some of my Pyroxeres. He could've just asked. Olusegun Obasanjo was terribly confused. He flew a cloaky-probey Orca with a mix of tank and anti-tank. What was he up to? Agents John E Normus, Ann Boncroft, Tisiphone Dira, and Catalyst Knight noticed Olusegun AFK autopiloting through highsec. They repeatedly invited him to private convos, but he never responded. After confirming that he was AFK, they rode into battle and won a glorious victory. 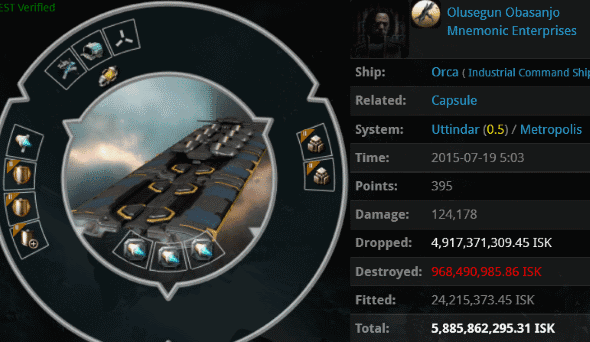 Nearly 5 billion isk of Carbon-86 Epoxy Resin was safely recovered. So far, Olusegun hasn't petitioned our Agents for reimbursement. Maybe he left his keyboard and never came back. ironwool barreled into Jita with a 25 billion isk jump freighter. 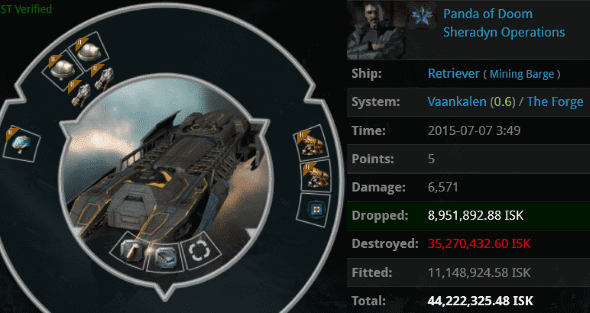 Such a ship can withstand a lot of damage in a 0.9 security system. When faced with a threat like this, the forces of good band together. A massive gank fleet was formed with 35 ships, including 16 Taloses. 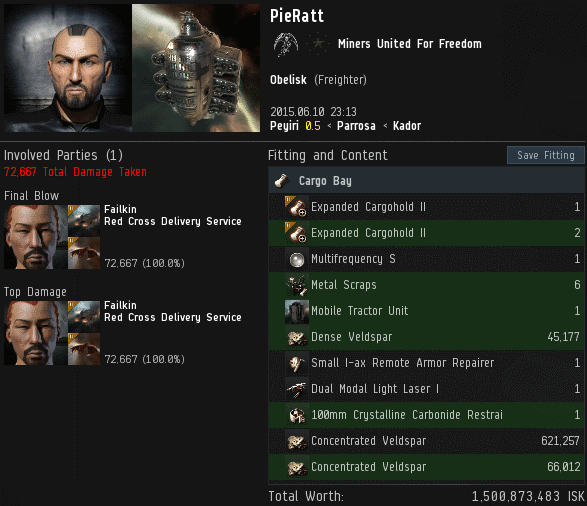 They brought justice to Jita! Many thanks to Agents Sophia Soprano, Salah ad-Din al-Jawahiri, John E Normus, Ilithyia Borgia, Sasha Cohenberg, JerryRin AT2016 Commentator, BoneyTooth Thompkins ISK-Chip, loyalanon, Ido Adudu, Fabulous Andy, OogaBooga WhereDa FreighterAt, Straight Up Dominated, Jason Kusion, Poopsock Jones, Yojiro, General Nelson, Generic5Guy, Galdor Amandilis, Krios Deninard, mooking, Unfit ForDoody, holdmybeer, Bob Painter, Mal Warre, SynthiaGreey, kaz89, Worlds Hatter, Seduxine, Martyr Oira, lock fire squish, Stein Cohenberg, Silvester Cohenberg, Sherman Cohenberg, Globby, and Etriza. Autopiloting through highsec in a rookie ship, Malleus Hereticus looked like nothing more than a newbie. Agent Aaaarrgg checked his profile. Malleus was a 2009 character with miner propaganda in his bio. That's no noob! 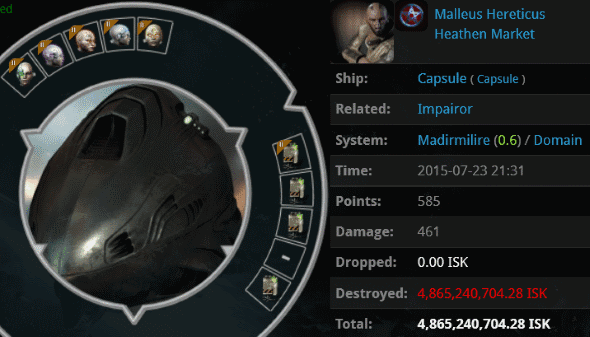 Our hero tore through the enemy's pod and shattered 4.8 billion isk worth of mining implants. As any New Order Agent can tell you, there's more than one way to harvest in highsec. I'd like to think it's more than a coincidence that highsec has improved so much since I took power. Case in point, another lovely day in highsec. 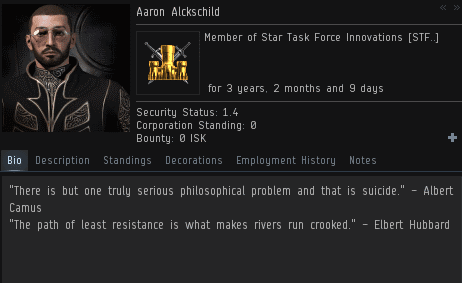 Aaron Alckschild had been playing EVE for more than five years. He'd seen a thing or two--but not much more. 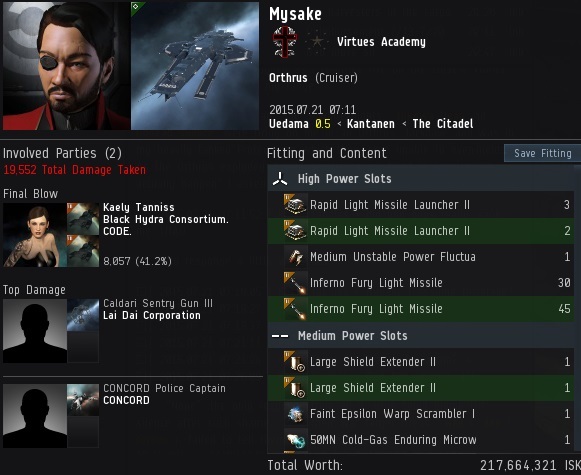 He spent his five years engaged in highsec PvE, very, very, very slowly grinding isk. Then, at last, something interesting happened: His freighter was bumped. Aaron attempted to engage his verbal warp core stabilizers, but to no avail. The bumper didn't wish to let Aaron's freighter go. Enia McCool > do you see all those flashy red guys in local? Enia McCool > they're with me, so you can choose to pay for me to "let you slip away"
The bumper claimed to be backed up by an Imperium/New Order gank force. However, Aaron didn't take her threats very seriously. His freighter wasn't caught in Uedama or Niarja, after all; he had the good fortune to be in Niyabainen, a 1.0 security system. This made Aaron almost completely invulnerable to ganks. However, there were some warning signs for Aaron to consider. Enia McCool made no effort to disguise her life's purpose. She linked plenty of freighter killmails in her bio. Aaron was running a great risk with his bot-aspirant hauling operation. His freighter was packed with blueprints. Actually, it wasn't "packed", since you can hardly fill such a large space with blueprints. Still, Aaron felt safe in the warm embrace of the 1.0 security system. He brushed aside the threats. A gank fleet of 29 vessels, including several Taloses, dropped in. Aaron's freighter and its expensive library of BPOs went boom. Enia McCool > 600m doesn't sound like much now does it? Aaron Alckschild > NNNOO ASHOLE NOOOOOOOOOOOOOOOOOO!"!!! In an instant, it occurred to Aaron that he needed to re-evaluate the situation. The carebear was filled with regret. This is a common attribute of the post-gank bot-aspirant. If only they possessed foresight in equal measure. Enia McCool > you didn't bother to check my bio did you? Aaron didn't think he was properly warned by Enia. Her warnings weren't enough, because Aaron hadn't believed them. Enia McCool > do you want the stuff or not? Incredibly, even after Enia had lived up to her promise of killing Aaron, the carebear practically accused her of being a scammer. Where's the trust? Aaron Alckschild > cant you just forgive me and give me the blueprints back for a price? In reality, everyone who engages in unlicensed highsec PvE is also a PvP'er. Everyone in highsec depends on the Code; it is a social compact, a mutual promise among all who dwell there. 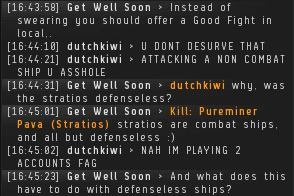 By violating the Code, carebears commit an aggressive act against all other players in highsec. Aaron Alckschild > are you still there? Aaron Alckschild > PLEASE, are you going to give them back? Aaron Alckschild > I know you must be laughing and having a good time fun, but I am devastated, I CANNOT AFFORD TO LOSE THIS! 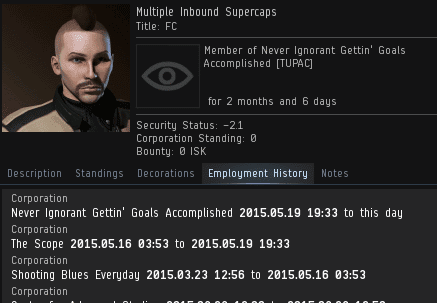 Carebears, grinding for isk will leave you feeling meaningless and empty. Especially when we destroy all the stuff you did your grinding for. Enia McCool > more along the lines of 10b I reckon, you don't happen to have that on you, do you? Aaron chose the wrong path in EVE and paid the price for it. Was there a way for the carebear to recover, or had his adventure in EVE come to an end? Although we frequently celebrate New Order victories, and the fact that the CODE always wins, it's easy to forget that continually winning over time is itself a victory. The New Order has been winning for more than three years. What does that look like for the average bot-aspirant? As time goes on, more carebears experience being ganked over and over again. Consider PieRatt, who has been a highsec carebear for six and a half years. He has suffered repeated losses to the New Order. That takes a toll. Finally, after many lost ships, he found a target for his anger: Agent Boarat Saagdiyev, who ganked one of PieRatt's Retrievers and, three days later, one of PieRatt's empty pods. Two days after losing the pod, PieRatt began sending strange EVEmails to Boarat. Many New Order Agents have developed similar "pen pals". PieRatt challenged Boarat to go to the Peyiri system, the same place where Boarat had ganked PieRatt on the two prior occasions. Boarat declined to do so. The next day, PieRatt sent another message, for no apparent reason. Half an hour later, the situation became more clear. PieRatt was angry about losing a freighter in lowsec. Though Boarat was not actually on that kill, PieRatt now projected all of his problems onto him, and saw Boarat as the culprit. Later that evening, PieRatt again EVEmailed Boarat, bragging that his freighter had been replaced. The invitation to join PieRatt in Peyiri was extended once more. A week later, PieRatt renewed his one-sided correspondence with Agent Boarat. It became clear that PieRatt was one of those "I'm mining right now and you can't stop me!" types. He failed to absorb one of the great lessons of the Code, which is that our Agents are the ones who set the terms of engagement. We attack our enemies at the time and place of our own choosing. When Boarat didn't appear in Peyiri, the carebear taunted our Agent. PieRatt couldn't understand that our Agents only show up when they feel like it. They may choose not to discipline a particular bot-aspirant at a given moment. Our most stubborn enemies sometimes take advantage of that fact to deliver taunts, as PieRatt did. However, sometimes our Agents do appear after they have been taunted. PieRatt was flying his freighter through Peyiri when it was suddenly bumped by two of Boarat's friends, Failkin and Emelie Petra. Incensed, PieRatt challenged them in local to try ganking him. Failkin left Emelie to continue bumping PieRatt's freighter alone. Failkin had other business to attend to. Specifically, he needed to change corps. Even more specifically, he needed to go join the 1-man alt corp that was currently at war with PieRatt's corp. Then he returned to say hello to PieRatt. Failkin, flying a Skiff, was now at war with PieRatt. After destroying the Veldspar-laden freighter, the Skiff podded PieRatt for good measure. See? Mining ships can shoot back, when piloted correctly. PieRatt attempted to log out, but his ship was destroyed anyway. 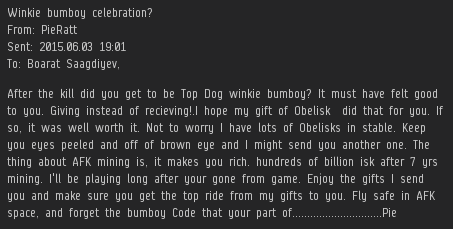 He logged back in and sent another EVEmail. He knew Boarat was behind the whole thing. PieRatt raged in Peyiri local. He cursed the New Order for its lack of intelligence. Being ganked had taken its toll on PieRatt. He admitted that he'd already started petitioning us years ago. Having denied the petitions, CCP surrendered the game to his hated enemies. According to PieRatt, The WINKIES always win. AWAYS! There are only two options for a carebear in PieRatt's position: Give in to the Code or give in to madness. PieRatt's choice was clear.